Summary : This tea from Adagio Teas is a pleasant mixture of quality green tea and mandarin orange. The orange flavor is quite weak, but still noticeable. Review : It's been a while since I've had a green tea. I tend to fall into "moods" where I'll prefer a spicy tea, then a herbal tea, then something totally else. Where these moods arise from, well, truthfully I have no clue. But in any event, as it's been well over two weeks since I've had a green tea, I felt in the mood tonight to give one a try. And the first green tea to show itself that seemed interesting was a tea from Adagio Teascalled Mandarin Orange. Here is how Adagio Teas explains this tea on their website : "Green tea from China with the delicate flavors of orange and cinnamon. A happy marriage of great taste and proven health benefits. Just the right touch of added flavors to liven up the cup. Makes a light and refreshing drink that's popular both hot and iced. If you are new to green tea, this lightly flavored tea may be a good place to begin." The fragrance of the leaves was ALL green tea. For all intents and purposes, if I hadn't read the label and hadn't been able to see the mandarin orange pieces in it, I would have never known that this tea was anything but a green tea. And truthfully, the flavor of this tea pretty much matches the fragrance. I was expecting a bit stronger flavor in this tea, due to the addition of orange and in particular cinnamon flavors. However, after looking over the description of the tea Adagio provides, I realized why this tea had such a "light flavor." Apparently, it was designed that way. You can NOT taste the cinnamon flavor in the tea at all, and what orange flavor there is is exceedingly sublte...you almost have to look for it. My guess is that the flavorings added to it are to reduce the "potency" of the normal green tea flavor, as I did find this green tea to be somewhat less in flavor than other green teas I've tried. Which, of course, matches perfectly with what Adagio says about this tea..."If you are new to green tea, this lightly flavored tea may be a good place to begin." A statement which I sort of agree with, although truth be told I think there are better "first green teas" to have than this one. Still, I can't complain too much about the flavor of the tea. Unlike many green teas, this one didn't really have a grassy flavor. And the quality of the leaves used was top-notch. Overall, I was a bit disappointed with the lack of orange/cinnamon flavor in this tea, but as I said, I suspect that was the point of this tea...to reduce the overall flavor of green tea, making this tea more palatable to "first time green tea drinkers." Recommendation : Yes. 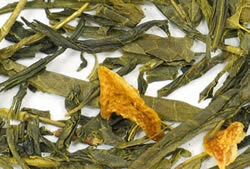 This tea from Adagio Teas is a pleasant blend of green tea and orange. The flavor of orange is very suble, and the flavor of cinnamon non-existent. On the other hand, the flavor of green tea is somewhat lighter than other green teas, no doubt owing to the infusion of orange and cinnamon. It's a pleasant tea...but not a superb one, at least to my taste buds.